Heavy rains lashed North India, trigerring flash floods and landslides. In the wake of heavy rains, a 'red ' was issued in Punjab and all educational institutions have been closed for today. Punjab has been witnessing widespread rain for the last two days and the downpour continued yesterday, prompting state authorities to review preparations to tackle flood-like situations. Schools have also been closed in Doda district of Jammu and Kashmir and in most places of Himachal Pradesh. Torrential rains trigerred flash floods in Himachal Pradesh. A high has been sounded for Kullu district. Several houses were also swept away in flash floods as the Beas is flowing above the danger level. More than 49,000 cusecs of water will be released from the Pong Dam in Kangra district today afternoon, as the water level in the dam is nearing the danger mark. A Bhakra Beas Management Board official has cautioned residents of low-lying areas in Himachal Pradesh and neighbouring Punjab to remain vigilant. In Uttarakhand, heavy rains led to landslides which blocked the roads to Badrinath, Kedarnath and Yamunotri, affecting the Chardham Yatra. 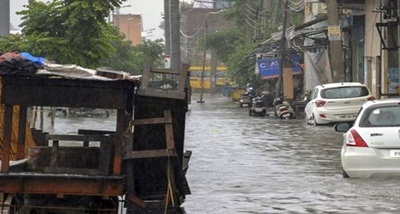 Heavy rains disrupted normal life in many cities of western Uttar Pradesh and damaging paddy and vegetable crops. Met department has predicted heavy rains in central and western part of state in next 48 hours. Amroha, Muzaffarnagar received heavy to very heavy rains. In Muzaffarnagar, torrential rain flooded almost all areas disrupting normal life along with power and traffic system. The city received around 120-milliliter rainfall in just 24 hours on Monday. Meerut also received 75 milliliters rainfall. Torrential rains at the end of the monsoon season have severely damaged paddy as well as vegetable crops in state. Heavy rains with strong winds have led to flattening of paddy in fields incurring heavy losses in the early-sown varieties of paddy. Rains also flooded the sugar cane and vegetable fields in many districts damaging the crops badly.